JEFFERSON CITY, Mo. 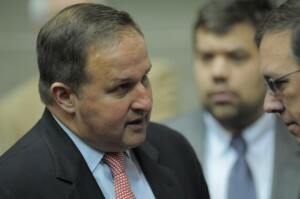 – After spending more than nine hours behind closed doors, Missouri House Speaker John Diehl faced questions for the first time since a new story broke accusing him of sending sexually explicit texts to a 19-year-old Capitol intern. When asked whether he, himself, wrote the sexually explicit text messages, Diehl dodged. “My statement speaks for itself,” he said, pointing to a statement where he apologized for his actions and took “full responsibility” for them, but never said whether he wrote the texts. Diehl said he did not have a sexual relationship with the intern, as the texts depicted the two of them to be seeking. When asked whether it was appropriate for him, essentially a boss, to keep his job while the subordinate, the student with whom he exchanged text messages, lost hers, Diehl refused to answer. Diehl also made one thing clear: He has no plans to step down as Speaker of the House and said he will be in the House on Thursday and Friday. He said it was his intention to serve out his full term, which would end in 2017. When Diehl walked into a caucus meeting in the House Lounge on Wednesday, he was greeted with a standing ovation by other Republicans. Diehl said that was a sign “they were judging me by the body of my work.” Still, in the meeting, at least two Republicans expressed concern and suggested that the caucus at least consider a vote on whether to retain Diehl as Speaker. In the meeting, Diehl asked for a couple of days to finish out session, and told lawmakers he, “would do the right thing” when it comes to staying on as House Speaker, according to one Republican. Throughout the day, Diehl met with small groups of Republican members to inform them of his mindset and to apologize personally for his actions. Those meetings, which began with a group of Republican women around 1 p.m., lasted until the party caucused around 7:30 p.m., and continued after until Diehl met the press around 11 p.m.
His exchange with reporters — which started in his office. and ended four floors below in the Capitol garage — lasted just over three minutes, before he jumped into an aide’s car and was driven away.